According to statistics released today by iQmetrix, the leading retail management software solutions provider in U.S and Canada, iPhone 5 accounts for 20% of smartphone activations in North America since its launch on September 21st. The analysis sampled 7,000 independent wireless retailers across the region, revealing year-over-year buying trends in the past year. Looking at the analytical data, it appears that iOS took the lead among all smartphone operating systems, with iPhones comprising 56.7 percent of all phones sold during the period, while Android took the second place with 40.9 percent share. 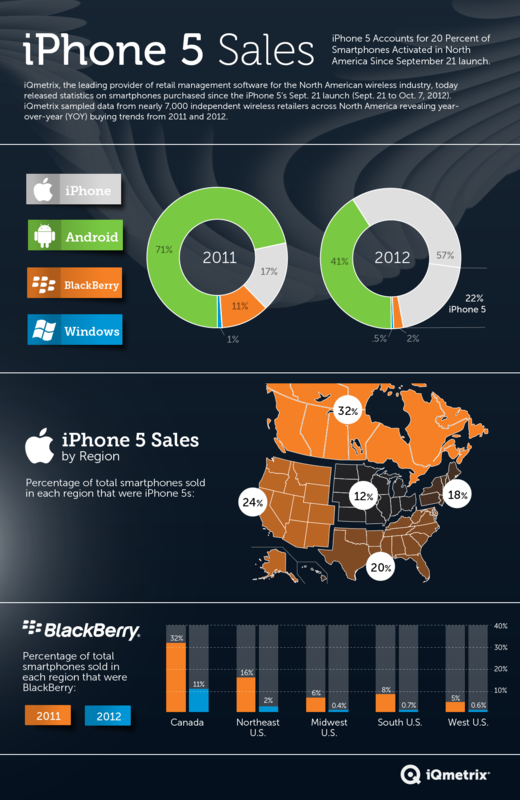 Highest regions for iPhone 5 sales were Canada (31.7 percent) and the Western U.S. (24.3 percent).